Love is an illusion. Between two people there is only despair and silence and alienation. Bergman knew about such things. --- Gunnar, A former assistant camera man to Ingmar Bergman. Into the closet, Gunnar.---Pam, a TV talk show host. With a title that leaves little room for doubt about what we are in for, comes the sudden impulse to count the number of doors in the simply furnished hotel room (designed by Carrie Mossman), its off-yellow walls as telling as the off-color and off-the-wall action ostensibly prescribed by co-authors Philip LaZebnik and Kingsley Day. A goofy-looking bellhop escorts a discontented woman to the room. She has left her husband at the front desk where he is presumably trying to find out what happened to their luggage. Within seconds after the bellboy leaves, the husband arrives. It only takes a few seconds of their conversation to realize that their marriage is on the rocks. Nevertheless Rebecca Gladney, who is accompanying her preoccupied husband Herb on a whirlwind multi-city book-signing tour to promote his book Marriage is Forever, wants to be sure of her investment. The conversation, mostly punctuated by Rebecca’s insinuations about Herb’s sexual inadequacies, goes on hold when she exits to the bathroom. Herb responds to a knock on the hotel door to find Pam Blair, a local TV host eager to have Herb appear has her guest that night. Having heard raised voices in the hall, Pam’s suspicions about the couple are aroused. Nevertheless, Pam gives Herb the details of his TV appearance and leaves. Rebecca comes out of the bathroom with a headache and leaves the room to purchase some aspirin. Herb exits to the bathroom paving the way for the hotel maid to enter the room from the door to the adjoining suite. After stealing a watch she sees on a table, she gives the all-clear sign to the indiscreet Senator Grant Ryan. The maid has mistakenly assumed that the room is vacant and will be perfect for the married Senator’s peccadillo with his bimbo girlfriend Gwenda. During the ensuing hanky-panky whichincludes a little derriere slapping and handcuffs amid split-second comings-and-goings, Pam manages to hide Gunnar Gustafson, a Swedish Ingmar Bergman-trained photographer in the closet to catch Herb in the act. 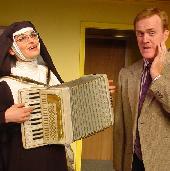 Of course, there is the senator’s wife Delilah to contend with when she gets wind of what’s going on -- and, not to be overlooked, is a singing accordion-playing nun eager to ingratiate herself with Herb with the hopes of making an appearance on the TV show. One has only to have looked at the program to see that there are only two actors in the cast. The authors have calculated the action with a meticulous if absurdist attention to probability. The dialogue is silly to a fault: She: "There is something between us." He: "Where?" This is a comedy that unashamedly wallows in the broadly comical genre that has maintained its popularity with the public from Plautius to Moliere to Feydeau and up to the contemporary under-the-bed, in-the-closet, out-the-window farces of Britisher Ray Cooney. Hardly in that league, but nevertheless fodder for the undemanding, Tour de Farce tries hard to duplicate that air of compromising naughtiness, questionable wit, and mindless lunacy. However, respect iw owed to the actors whose job it is to make quick-second changes of costume and morph into different characters for two hours over two acts. Ames Adamson and Prentiss Benjamin hurtle bravely through the shtick-filled demands of this convoluted comedy with the speed and dexterity of Olympic champions. Adamson, a versatile farceur, has played numerous roles at N.J. Rep. and other New Jersey venues, but none, I suspect, were as demanding as the five roles he is currently playing. Shades of the late comic Red Skelton can be seen in his recklessly over-the-top acting, facial contortions, double takes and blatant mugging. Funny as it is to see a man romping around in boxer shorts, hand-cuffed to a bed, or dressed in drag (think Barbara Bush), it is the aura of doom and gloom that Adamson hilariously projects as the Swedish photographer that rings the bell. Benjamin may not be Adamson’s peer when it comes to defining a character but she nevertheless employs some deft body language as she assumes the guise of an East European maid, the sexiest maneuvers of the publicity-seeking Gwenda, the screeching of a tone-deaf nun (eat your heart out Florence Foster Jenkins), and the haranguing of the disgruntled wife. Benjamin is the daughter of actor/director Richard Benjamin and actress Paula Prentiss, both of whom were in the audience beaming throughout the nonsense, with parental delight. There are moments when the actors have to change a wig and a costume off-stage while they simultaneously continue a conversation as another character. If the overall impression one gets of this comedy is that it is less about its characters than it is about multi-tasking, director James Glossman makes no bones about his willingness to have his players chew the scenery with a ferocious sense of abandon. The audience appeared to be seduced by the scent of amateurism that pervaded throughout and they responded with vigorous applause at the end. However, a director with a clearer vision and a stronger control over performances could have shaped this hapless affair into a real howler. Regional and community theaters with a small budget and a pair of fearless thespians should have a field day with this one. On a more sane note: Executive Producer of N.J. Rep. Gabor Barabas gave a short pre-show that touched the hearts of everyone as he shared with us the news that he was recovering from a stroke. “"How could I play the stroke card and encourage subscriptions," he pondered to himself as he lay in the hospital bed. Also a medical doctor by profession, Barabas is also a theater lover whose dedication to N.J. Rep. is duly noted. Hats off to wife SuzAnne, N.J. Rep’s Artistic Director, for getting both a show and a husband on their feet. hursday through Saturdays at 8PM, selected Saturdays at 4PM, and Sundays at 2PM. Reviewed by Simon Saltzman based on Sunday matinee January 29 performance.